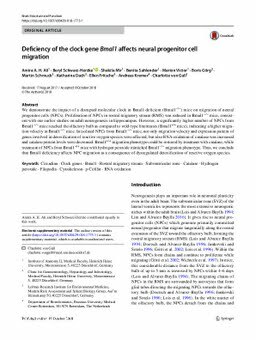 We demonstrate the impact of a disrupted molecular clock in Bmal1-deficient (Bmal1−/−) mice on migration of neural progenitor cells (NPCs). Proliferation of NPCs in rostral migratory stream (RMS) was reduced in Bmal1−/− mice, consistent with our earlier studies on adult neurogenesis in hippocampus. However, a significantly higher number of NPCs from Bmal1−/− mice reached the olfactory bulb as compared to wild-type littermates (Bmal1+/+ mice), indicating a higher migration velocity in Bmal1−/− mice. In isolated NPCs from Bmal1−/− mice, not only migration velocity and expression pattern of genes involved in detoxification of reactive oxygen species were affected, but also RNA oxidation of catalase was increased and catalase protein levels were decreased. Bmal1+/+ migration phenotype could be restored by treatment with catalase, while treatment of NPCs from Bmal1+/+ mice with hydrogen peroxide mimicked Bmal1−/− migration phenotype. Thus, we conclude that Bmal1 deficiency affects NPC migration as a consequence of dysregulated detoxification of reactive oxygen species.